A group of private business leaders want to resurrect Salt Lake City’s abandoned Wingpointe Golf Course. It won’t come cheap. (Francisco Kjolseth | The Salt Lake Tribune) People gather at the Wingpointe Golf Course, adjacent to Salt Lake International Airport, on Tuesday, Oct. 16, 2018, for an announcement regarding plans to reopen the course. Congress recently passed the Federal Aviation Administration Act, which included Rep. Chris Stewart's language to allow Salt Lake City to reopen the golf course that closed in 2015. 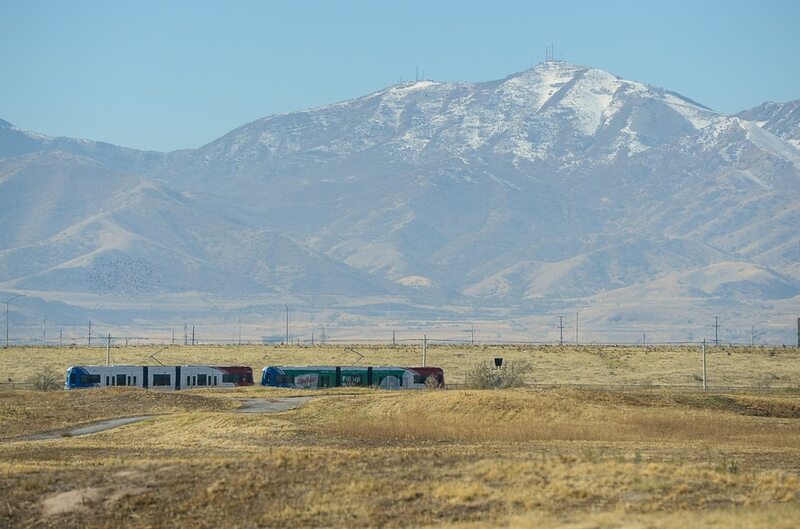 (Francisco Kjolseth | The Salt Lake Tribune) The TRAX Green Line passes the Wingpointe Golf Course, which closed in November 2015. Rep. Chris Stewart (R-Utah) announced plans to reopen Wingpointe on Tuesday, Oct. 16, 2018. Congress recently passed the Federal Aviation Administration Act, which included Stewart's language to allow Salt Lake City to reopen the golf course for public enjoyment. (Francisco Kjolseth | The Salt Lake Tribune) Rep. Chris Stewart (R-Utah) attends an announcement regarding the plans to reopen Wingpointe Golf Course on Tuesday, Oct. 16, 2018. Congress recently passed the Federal Aviation Administration Act, which included Stewart’s language to allow Salt Lake City to reopen the golf course for public enjoyment. (Francisco Kjolseth | The Salt Lake Tribune) Rep. Chris Stewart (R-Utah) attends an announcement regarding plans to reopen Wingpointe Golf Course on Tuesday, Oct. 16, 2018. Congress recently passed the Federal Aviation Administration Act, which included Stewart’s language to allow Salt Lake City to reopen the golf course for public enjoyment. (Francisco Kjolseth | The Salt Lake Tribune) A tattered flag on a green at Wingpointe Golf Course ages away in the sun since closing in November 2015, but the course could soon see a rebirth after an announcement on Tuesday, Oct. 16, 2018. Congress recently passed the Federal Aviation Administration Act, which included Rep. Chris Stewart's language to allow Salt Lake City to reopen the golf course for public enjoyment. (Francisco Kjolseth | The Salt Lake Tribune) People gather at the Wingpointe Golf Course, adjacent to Salt Lake International Airport, on Tuesday, Oct. 16, 2018, for an announcement regarding plans to reopen the course. Congress recently passed the Federal Aviation Administration Act, which included Rep. Chris Stewart's language to allow Salt Lake City to reopen the golf course that closed in 2015. (Francisco Kjolseth | The Salt Lake Tribune) Having just been handed a Make Wingpointe Great Again hat, Rep. Chris Stewart (R-Utah) attends an announcement regarding plans to reopen Wingpointe Golf Course on Tuesday, Oct. 16, 2018. Congress recently passed the Federal Aviation Administration Act, which included Stewart's language to allow Salt Lake City to reopen the golf course for public enjoyment. (Francisco Kjolseth | The Salt Lake Tribune) In disrepair since November 2015, the Wingpointe Golf Course adjacent to Salt Lake International Airport could soon see a rebirth. Congress recently passed the Federal Aviation Administration Act, which included Rep. Chris Stewart's (R-Utah) language to allow Salt Lake City to reopen the golf course for public enjoyment. (Francisco Kjolseth | The Salt Lake Tribune) Golf equipment sits idle and in disrepair since the Wingpointe Golf Course closed in November 2015, but the course could soon seen a rebirth after an announcement on Tuesday, Oct. 16, 2018. Congress recently passed the Federal Aviation Administration Act, which included Rep. Chris Stewart's language to allow Salt Lake City to reopen the golf course for public enjoyment. (Francisco Kjolseth | The Salt Lake Tribune) In disrepair since closing in November 2015, the Wingpointe Golf Course could soon seen a rebirth after an announcement on Tuesday, Oct. 16, 2018. Congress recently passed the Federal Aviation Administration Act, which included Rep. Chris Stewart's language to allow Salt Lake City to reopen the golf course for public enjoyment. (Francisco Kjolseth | The Salt Lake Tribune) The 200-yard driving range marker at Wingpointe Golf Course ages away in the sun since the course closed in November 2015, but it could soon see a rebirth after an announcement on Tuesday, Oct. 16, 2018. Congress recently passed the Federal Aviation Administration Act, which included Rep. Chris Stewart's language to allow Salt Lake City to reopen the golf course for public enjoyment. (Francisco Kjolseth | The Salt Lake Tribune) Golf equipment sits idle and in disrepair since the Wingpointe Golf Course closed in November 2015, but the course could soon seen a rebirth after an announcement on Tuesday, Oct. 16, 2018. Congress recently passed the Federal Aviation Administration Act, which included Rep. Chris Stewart's language to allow Salt Lake City to reopen the golf course for public enjoyment. 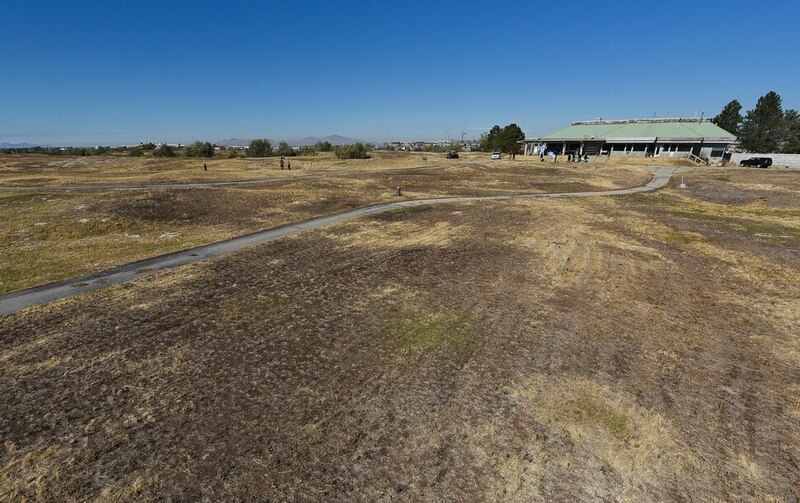 (Francisco Kjolseth | The Salt Lake Tribune) In disrepair since closing in November 2015, the Wingpointe Golf Course could soon seen a rebirth after an announcement on Tuesday, Oct. 16, 2018. Congress recently passed the Federal Aviation Administration Act, which included Utah Rep. Chris Stewart's language to allow Salt Lake City to reopen the golf course for public enjoyment. (Francisco Kjolseth | The Salt Lake Tribune) Golf equipment sits idle and in disrepair since the Wingpointe Golf Course closed in November 2015, but the course could soon seen a rebirth after an announcement on Tuesday, Oct. 16, 2018. Congress recently passed the Federal Aviation Administration Act, which included Rep. Chris Stewart's language to allow Salt Lake City to reopen the golf course for public enjoyment. (Francisco Kjolseth | The Salt Lake Tribune) Rep. Chris Stewart (R-Utah), left, joins David Shipley of the Wingpointe Community Initiative Inc. on Tuesday, Oct. 16, 2018, as they attend an announcement regarding plans to reopen Wingpointe Golf Course. Congress recently passed the Federal Aviation Administration Act, which included Stewart's language to allow Salt Lake City to reopen the golf course for public enjoyment. (Francisco Kjolseth | The Salt Lake Tribune) A sample score card and concept golf course configuration are on display at Wingpointe Golf Course near the airport, where Rep. Chris Stewart (R-Utah) joined a Tuesday, Oct. 16, 2018, announcement regarding the plans to reopen the course. Congress recently passed the Federal Aviation Administration Act, which included Stewart's language to allow Salt Lake City to reopen the golf course for public enjoyment. (Francisco Kjolseth | The Salt Lake Tribune) Golf equipment sits idle and in disrepair since the Wingpointe Golf Course closed in November 2015, but the course could soon seen a rebirth after an announcement on Tuesday, Oct. 16, 2018. Congress recently passed the Federal Aviation Administration Act, which included Rep. Chris Stewart's language to allow Salt Lake City to reopen the golf course for public enjoyment. (Francisco Kjolseth | The Salt Lake Tribune) Press, supporters and city officials gather at Wingpointe Golf Course on Tuesday, Oct. 16, 2018, for an announcement that could bring the course back to life after it closed down in November 2015. Congress recently passed the Federal Aviation Administration Act, which included Rep, Chris Stewart's language to allow Salt Lake City to reopen the golf course for public enjoyment. As he drove one of his out-of-state clients to the Salt Lake City International Airport, local businessman David Shipley tried to explain the abandoned clubhouse and dead grass in an adjacent parcel that was once home to a “world class” golf course. Wingpointe, operated by Salt Lake City, was shuttered in 2015 after a series of events involving land use costs and the federal government, Shipley told the businessman, and it has since fallen into disrepair. Shipley is now the president of Wingpointe Community Inc., a private sector group that’s working to resurrect a golf course once thought dead. It won’t come cheap. The irrigation system will have to be rebuilt, the course redesigned, cart paths pulled up, greens resurfaced and bunkers replaced — all to the tune of around $10 million or $15 million, Shipley said. But he said he and other investors are committed to putting in the money needed to return the course to its former glory, without any cost to taxpayers. The Arthur Hills-designed links-style course, which lies south of the airport, opened in 1990. The airport bought the site in the 1970s and was leasing it to the city for $1 per year before the Federal Aviation Administration stepped in, in 2012, to insist the airport charge a fair-market rate for the property. That led to an agreement under which the city, via its dedicated Golf Fund, would pay an increasing annual lease to the airport starting at $55,000 in 2014, rising to a full market-rate price of $150,000 the next year. City officials said last year that a fair-market rent for the property could be as high as $2.4 million per year — more than twice Wingpointe’s highest-ever annual revenues. Besides the lease payments, the City Council had in 2016 authorized $67,000 to keep up watering and other minimal maintenance to prevent the course from reverting to its natural state. But last November, the council voted to stop putting money into the course altogether, since it seemed unlikely to ever see action again. President Donald Trump, however, recently signed a bill that included language from Utah Rep. Chris Stewart allowing the federal government to waive a property tax requirement on property like Wingpointe — making it much more feasible to reopen the course. The only obstacle that remains in the way for a projected 2020 reopening of the course — timed with completion of the first phase of reconstruction of the Salt Lake City International Airport — is Salt Lake City’s approval of a long-term land lease for use of the property. Mayor Jackie Biskupski said she’s been working with Stewart for years on efforts to reopen Wingpointe and is excited to have a conversation with business leaders about what comes next now that Congress has weighed in on the issue. 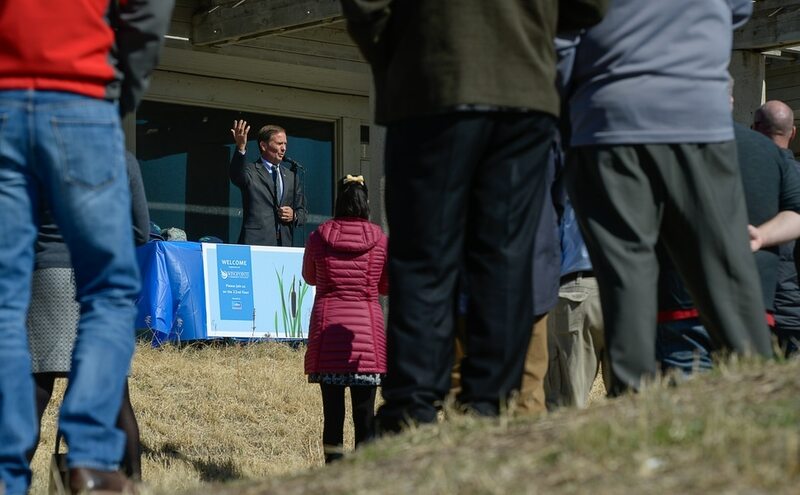 While the project is still in its early phases, Shipley said he wants to see the new course become a permanent, dedicated home for the First Tee of Utah, a nonprofit organization dedicated to getting young people involved in golf. He’d also like the course to become home to the University of Utah’s golf team and to provide anti-recidivism landscaping programs for inmates from the new nearby state prison.